As you know by now, Marvel's Star Wars comic is hitting shelves next month (and is supposed to be making a pretty big landing) - and inevitably, that means oodles and oodles of variant covers. The latest variant, from Hasbro, might just be the best yet though. Look at all those toys! 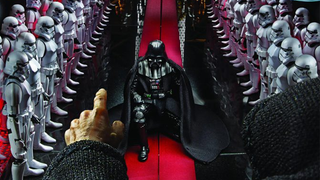 Apparently there was no extensive computer trickery involved in creating the image, with all the action figures posed together on custom-scaled Throne Room set - which if true, is a pretty impressive feat. I'm imagining a severe case of Stormtrooper dominoes occurring with one accidental knock. But it goes to show just how cool Hasbro's Black Series is if they can be used to make wonderful shots like this. I already have 2 Stormtroopers on my desk. Surely I could somehow make room for another 48?